Embroidery apron There are 2 products. It is so graceful and full of charm you will never want to take it off! Swallows nesting in old roses and orget-me-nots and beautiful italics all in bloom… A delight to sew and to look at! Made from 100% 12 count linen. Trimmed with a pink bias binding. 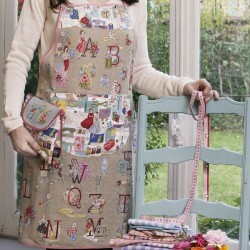 The pouch and top of apron are made from a beautiful cotton fabric with a vintage delightful retro style. 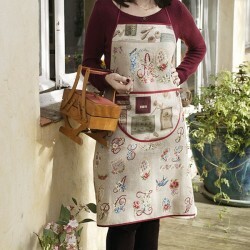 Attention, the Vintage motifs vary from one apron to another. So much the better – no-one will have the same !